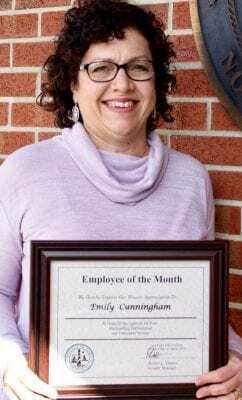 Emily Cunningham, senior foreign language interpreter with the Clinical Services Division of the Department of Health and Human Services, is the April 2019 Dare County Employee of the Month. Debbie Dutton and Marge Whitley presented Cunningham with the award at the April 1 Board of Commissioners meeting. “Since Emily was hired in 2012, she has always been eager to learn and appears to enjoy whatever task she undertakes. In her position, she exceeds expectations in every way. Management, providers, nurses, and her coworkers are always complimentary of her skills and professionalism,” Whitley said. When Cunningham is not performing her regular duties as a foreign language interpreter, she may be found registering new patients, making appointments, or answering the phone; she seeks out additional tasks in an effort to assist her coworkers and management. She recently helped the clinical staff by sorting and copying necessary paperwork that had to be duplicated for operations at the new Northern Beach Office and also volunteered to assist with setting up its registration and eligibility offices. “Because of her knowledge, patience, and skills, she is asked to train new staff in the use of our electronic medical records system as it relates to the registration process, as well as chart preparation and program review. Each of our programs has rules, policies, and procedures that are mandated by the state. She knows them well and imparts that knowledge on new staff,” said Whitley.